Traveling about 257 miles above the Atlantic Ocean northeast of Puerto Rico, the unpiloted Progress 58 Russian cargo ship docked at 11:57 a.m. EST to the rear port of the Zvezda service module of the International Space Station. The craft is delivering three tons of food, fuel, supplies and experiment hardware to the six crew members aboard the orbital laboratory. 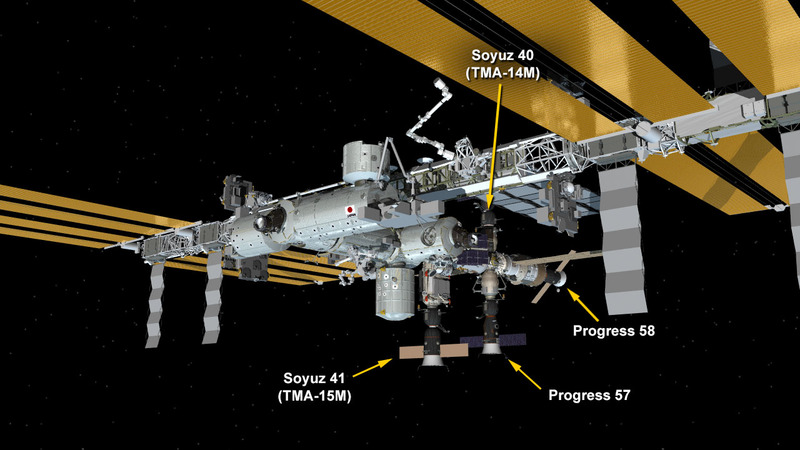 Progress 58 is scheduled to remain docked to the space station until August. Meanwhile, astronauts in the U.S. segment of the station are reviewing procedures for a trio of spacewalks. The first is set to begin Friday at 7:10 a.m. Spacewalkers Barry Wilmore and Terry Virts will exit the orbital lab to set the stage for a pair of new commercial crew vehicle docking ports to be installed later this year. Outside the station on Sunday, robotics controllers on the ground maneuvered the Canadarm2 with the Dextre attached to remove and replace a faulty Remote Power Controller Module (RPCM). The RPCM provides backup commanding capability to the port Thermal Radiator Rotating Joint.